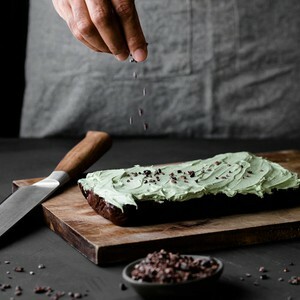 I used this Coconut & Vanilla Frosting recipe and added in 1 tsp matcha powder, 1/2 - 1 tsp spirulina powder and used only 1 cup of water and a few drops of quality peppermint essential oil - this needs to set overnight. I froze the leftovers (didn’t need all the icing) and it made the yummiest ice-cream, simply top with grated chocolate or cacao nibs. Alternatively, you can serve it with a generous scoop of Peppermint & Coconut Ice Cream from our Sugarless Sweets eBook or my Chocolate Bulletproof Ice Cream recipe instead, you can even add in a few drops of peppermint essential oil to the mix.